Ages 4 through 6. 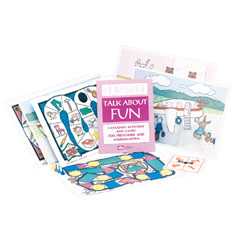 Use the game boards, picture cards, and instructional activities in this kit to help children label words, describe noun functions, categorize words, make comparisons, and describe events. The activities also strengthen the imaginative uses of language. Reproducible pictures are included. This product has been used extensively with children who have language disorders. It also is great for use with preschoolers who need language stimulation.